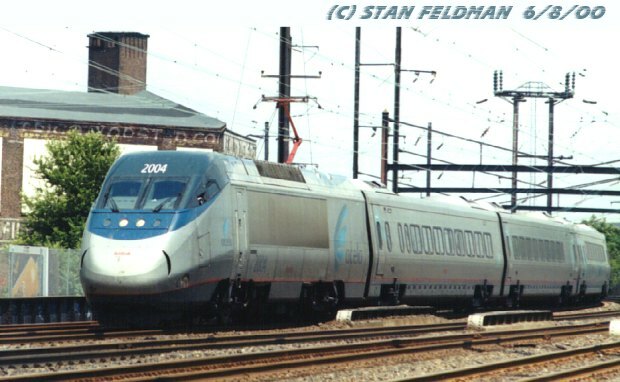 Amtrak Acela Test Trains Page 2-of-3-! !-Stan's RailPix. 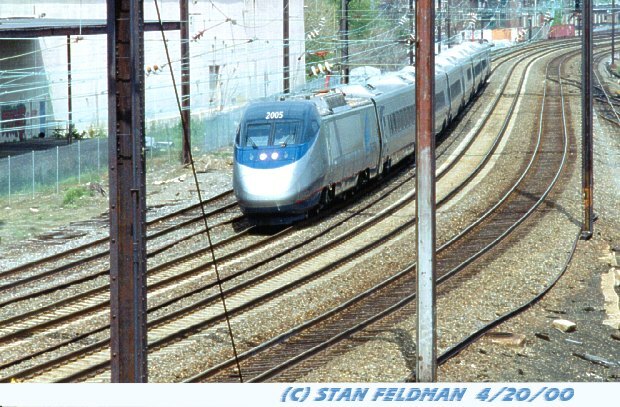 Amtrak Acela Test Trains Page-2-of-3-! 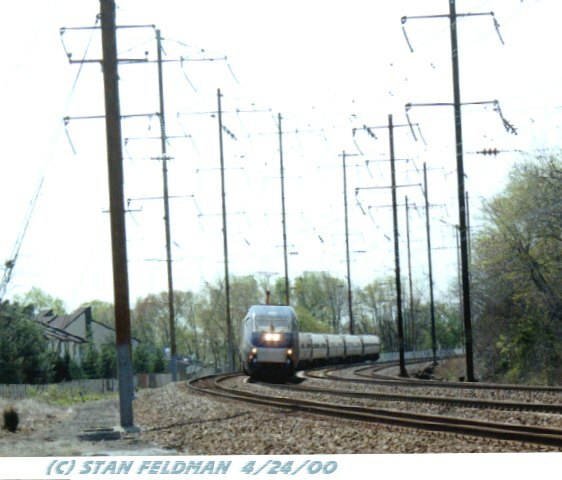 -Click here to see Amtrak Acela HSEL (High-Speed Electric Locomotive , rated at 6250 H.P) #2005 leading a test train into the curve at Frankford Junction, Phila. Penna. 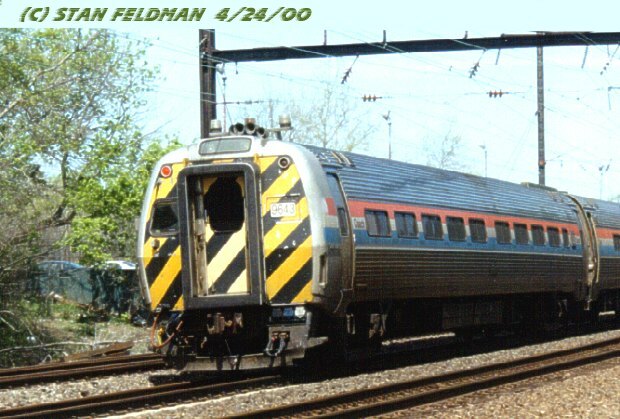 The Acela Express Test train is returning to Penn Coach Yard after running to Newark N.J. 4/20/00. 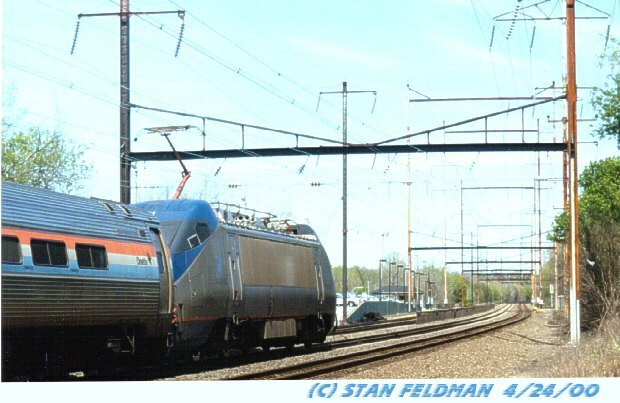 -Click here to see Amtrak Acela HSEL (High-Speed Electric Locomotive , rated at 6250 H.P) #2005 on the rear of a test train. The Acela Express Test Train is passing the old Frankford Jct. Station, on the return trip to Penn Coach Yard in 30th Street Station, Phila. Pa. 6/8/00. 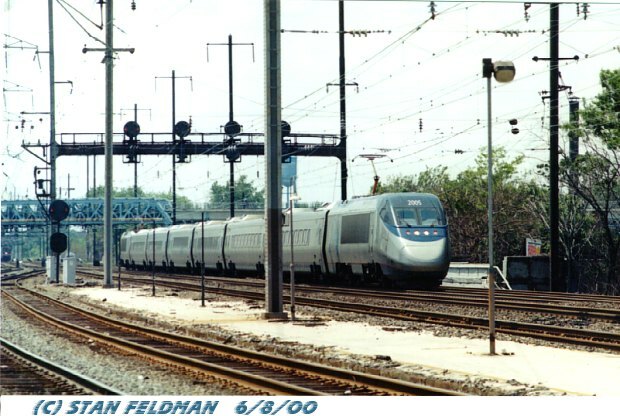 -Click here to see Amtrak Acela HSEL (High-Speed Electric Locomotive , rated at 6250 H.P) #2004 leading an Acela Express test train out of the curve at Frankford Junction, Philadelphia, Pa. With the intake vents exposed, it looks like the Acela Express is smiling !! 6/8/00. -Click here to see Amtrak Acela High Horsepower Locomotive HHP-8 #655, on the rear of a test train heading towards Holmesburg Junction, Phila. 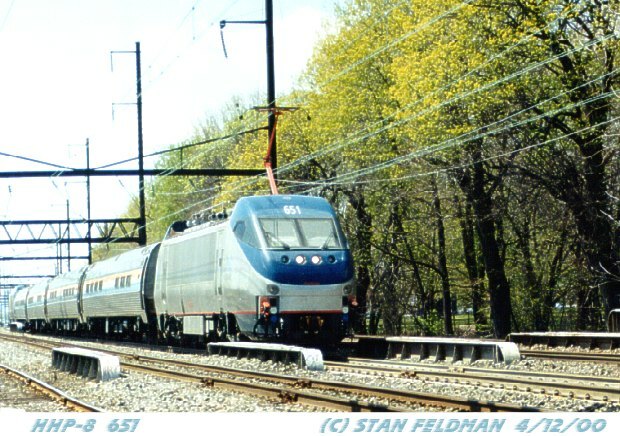 Pa. On the return trip, HHP-8 #655 will lead the 4 car test train with Amtrak Acela HHP-8 #651 on the rear. 4/12/00. -Click here to see Amtrak Acela High Horsepower Locomotive HHP-8 #651 running eastward (north) approaching Torresdale Station, on The Northeast Corridor, in Philadelphia Pennsylvania. 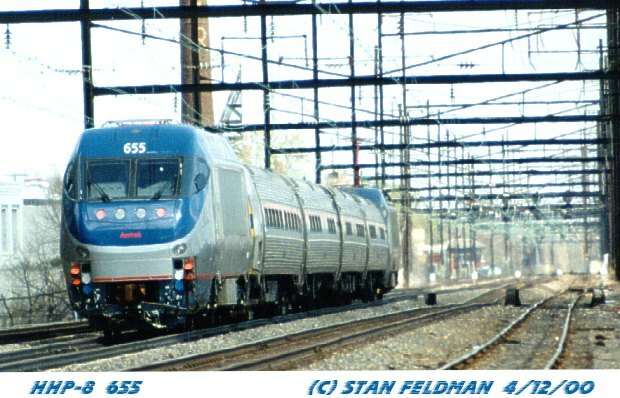 The Acela Test train will stop at Newark N.J and return with Acela HHP-8 # 651 pushing the train. 4/24/00. -Click here for a side view of Amtrak Acela High Horsepower Locomotive HHP-8 #651 as it pulls its test train eastward (north) past Torresdale Station, Phila. Pa. (MP 74.6) At the rear of the test train is Amtrak Cab Control car #9643. 4/24/00. -Click here to see Amtrak Cab Control Car # 9643 at the rear of a 6 car Test Train pulled by Amtrak Acela High Horsepower Locomotive HHP-8 #651. The test train is passing Torresdale Station, Philadelphia Pennsylvania. Amtrak Cab Control Car #9643 was used on the Amtrak Atlantic City Trains. 4/24/00. Click here for PAGE 1, OF ACELA TEST TRAINS. 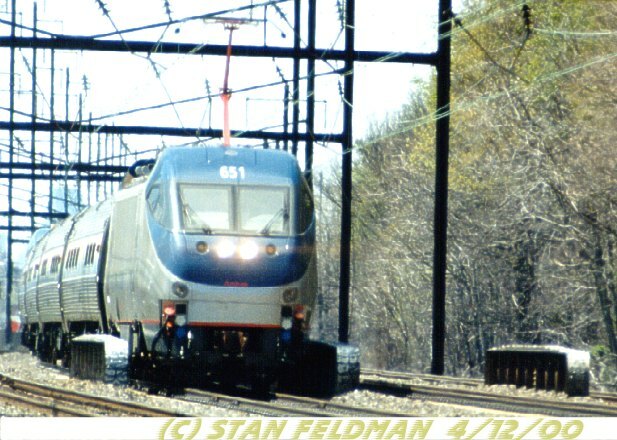 Click here for PAGE 3, OF ACELA TEST TRAINS.